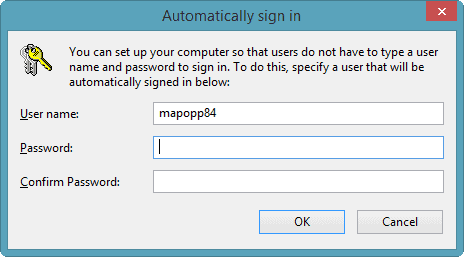 By default, you can’t log into Windows 8.1 automatically if you’re using a Microsoft Account. This is meant to protect your account, because it’s linked to the cloud. This protects anybody in your home or office from having unauthorized access to your computer and its contents. However, with a few behind the scenes steps, you can log into Windows 8 automatically with a Microsoft Account with this guide. TechNorms has shown you how to logon to Windows 8 automatically before with this registry hack. But, for some, registry hacks seem scary and intimidating. If you mess up a registry hack, you can actually cause more harm than good for your PC. If you don’t want to mess with your registry, you can use this method to make it easier to logon automatically with a Microsoft or Local Account. Make sure to create a system restore point before following this guide to ensure if any issues arise, you can recover your system to a previous point with no damage done. This will work for a Microsoft Account or a Local Account in Windows 8 and Windows 8.1. As long as the below steps are followed for multiple accounts on a PC, the last logged in account will automatically be logged into upon a system restart. If you have multiple accounts, we strongly advise you to consider the ramifications of utilizing automatic logon in Windows 8 or 8.1. Before you begin, you must be logged into the Administrator account for you Windows 8 PC for these steps to work. If you are setting up an Administrator level account to login automatically, you must make sure that the account is part of your HomeGroup, along with the Administrator group, to continue. If not, you’ll encounter issues once logged in trying to manage your HomeGroup. Please Note: This guide was written with Windows 8.1, but the steps work in Windows 8 as well. 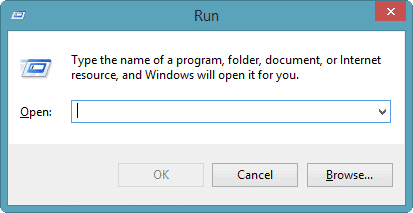 To get started, open the Run Command with the “Windows + R” keyboard shortcut. 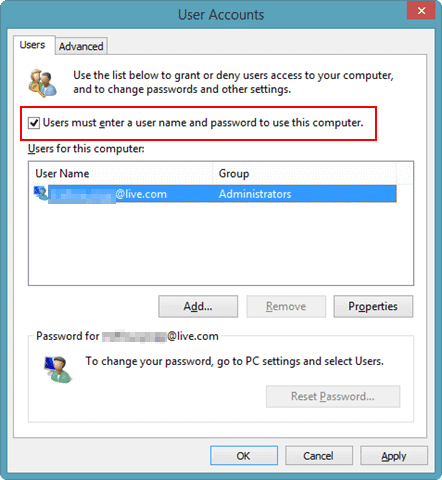 If the User Account Control (UAC) warning appears, enter the Administrator password to proceed. If you do not have the Administrator password or failed to heed our warning about being logged in as the Administrator, you’ll need to get the password and log back into the proper account before continuing. You’ll open the advanced menu for User Accounts with that command. This lets you change a variety of options, along with setting up automatic login in Windows 8. Now, click “Apply.” on the next window. The next time you restart your PC, you’ll automatically logon to Windows 8 with the last logged in account, whether it’s a Microsoft or Local Account. You are able to do this for every account on your Windows 8 PC from the Administrator account if you want to. You just need to select each user account, enter its password, and you’ll be set to automatically login. If you do this with just a single account on a PC, as long as that account is the one last longed on before a PC is booted, it’ll automatically logon for you. If the last account used doesn’t have auto-logon enabled, then you will have to put in the password for that account or yours to continue to logon. This is to prevent any issues on a multi-user PC that can arise due to auto-logon. Keep in mind that if you change the password of your Local or Microsoft Account, you will need to turn off automatic login, then turn it back on again to enter the new password. Unfortunately, there’s not an easier way to do that at this time in Windows 8. There is no work around for this and most likely never will, since Microsoft would prefer you secure your account linked to the cloud by forcing a logon with a password in Windows 8 and 8.1. 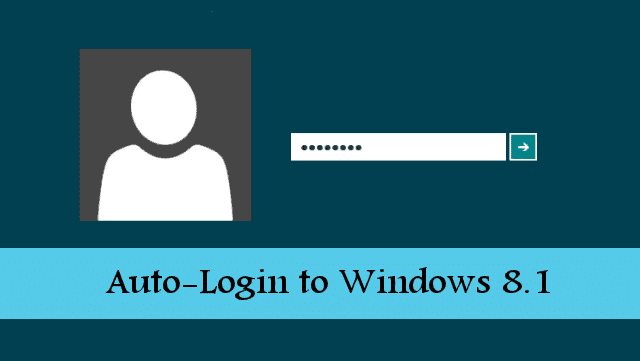 Automatic logon is a very dangerous thing to use on any PC with multiple accounts. Whether it’s your family, friends or co-workers, tread lightly before applying this option on your Windows 8 or Windows 8.1 PC. If your account is automatically logged in, this gives whoever is on your computer – even strangers – access to every file, folder, program and more. If you have sensitive information, it becomes public and can be shared or used in a malicious way. While you may trust everyone in your home or office with your personal data, you never know when it may be used against you in a way you can’t recover from. Think carefully before setting up your Windows 8 or 8.1 PC to logon automatically. Ideally, you want to login to your PC automatically if you’re the only one using it. For multiple users, you could risk your personal information and files with others you may not want to have access to them. Proceed with caution if you want to login to Windows 8 automatically but if you choose to use this method, rest assured that it makes it much easier to get started on your computer when it boots up. It even compliments the fast bootup Windows 8 introduced to the operating system at launch.